In 1918, area newspapers urged officials and residents to arrive at the Racine-Kenosha Joint County Training School for Teachers in Union Grove, where members planned to lay a cornerstone time capsule on Sept. 4. The weather, according to History Seekers’ Judith Schulz, forced officials to move the laying until three days later. However, Schulz, the co-chair of the Cornerstone Committee, stated the message remained the same. A century later, the clipping came true, according to Schulz. “They were right; this has touched so many lives,” Schulz said in front of scores of people during the opening of the cornerstone capsule Saturday. The building, which now serves as the Union Grove Municipal Building, was the breeding ground for future teachers until the school closed in 1971. History Seekers member and former student of the school, Frank Lamping, recalled his time as a kindergarten through eighth grade student. While Lamping reflected, Schulz hardly could contain her excitement as she was about to open the 100-year-old time capsule. “I couldn’t sleep last night, I was so excited,” said Schulz, who co-chaired the Cornerstone Committee with Marge Martin. Although the copper box was the size of a shoebox, the small container withstood time, according to Schulz. She said the container kept items free of moisture. The copper box unveiled eight items, including four newspapers, which are no longer published or have merged. Additionally, the capsule held the 1918-19 course catalog for the Racine-Kenosha Joint County Training School for Teachers. It also had official directories for Racine and Kenosha county public officials. Flipping through each newspaper, she told the crowd of hundreds the headlines turned back the clock to World War I. “This was around the time of World War I,” Schulz said. Other newspapers included in the cornerstone were The Telegraph-Courier (Kenosha), The Racine Journal-News and The Union Grove Enterprise. In the opening remarks of the cornerstone opening, Union Grove Village President Mike Aimone said the unveiling would not have been possible without the History Seekers, an organization dedicated to keeping area history alive. 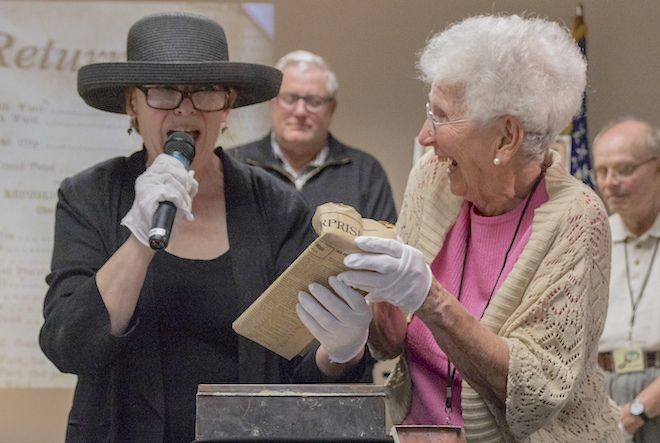 “On behalf of the Village of Union Grove, I’d like to recognize and thank the History Seekers for their tireless efforts of not only preserving our proud history, but to share and educate the next generation of our past,” Aimone said. The History Seekers were responsible for creating display cases of artifacts housed inside the municipal building. Aimone, meanwhile, said former students of the school have often contacted village officials about visiting the building to view the items. “They always rekindle their love and memories of the building,” Aimone said. The entire story can be read in the Sept. 13-14 editions of the Westine Report, Waterford Post and Burlington Standard Press.